Investment Stewards of retirement plans (e.g. investment committee members, trustees) have a responsibility to monitor the advisors they have hired. CEFEX has the expertise to assist in this task. In other industries, product manufacturers mandate their suppliers to achieve ISO quality management system certification in order to ensure the highest level of quality assurance in their product. Isn't this what retirement plans should expect? Many retirement plans are now mandating the CEFEX certification of advisory firms. CEFEX and fi360 have developed a standard Request for Proposal (RFP) template, which can be used by Investment Stewards of 401(k) plans to select their advisory firms. CEFEX-certified advisory firms are very well prepared to respond to this RFP because many of the requirements have already been addressed in the CEFEX assessment. This RFP is suitable for distributing to plans, as they have the responsibility to prudently select their investment advisor(s). The CEFEX certification of an Investment Advisory firm verifies the existence of due diligence in selecting investment options, thereby forming an excellent basis for the oversight by a Steward. Through the selection of a certified firm, the Investment Steward effectively delegates this highly specialized oversight task to the CEFEX Analyst, who is an investment expert. When a Steward selects a CEFEX-certified advisory firm, the Steward has effectively applied a due diligence process since the CEFEX firm has been rigorously assessed to documented diligence parameters. Fundamental due diligence screens for governance, and fiduciary practice, allow the Steward to focus on specific investment strategies and other issues, such as participant retirement readiness. A CEFEX-certified firm is assessed on an annual basis, when both qualitative and/or organizational changes are reviewed to determine whether or not fiduciary practices are affected. The CEFEX-certified firm is obligated to report changes to its clients, and this is verified in the assessment process. Investment portfolios of CEFEX Investment Advisors are annually benchmarked against peer groups using the fi360 Investment Analyzer. The CEFEX Analyst uses this tool to identify watch-listed investment options, including a screen for fees. Thresholds for watch-lists are established and the Advisor must explain significant deviations. The CEFEX assessment includes a detailed review of the Advisory firm’s Service Agreement to ensure compliance with regulation, specifically § 408(b)(2) and to ensure it is used for all clients. Since the certification is renewed annually, this periodic review helps the Investment Steward fulfill this obligation as agreements change over time. 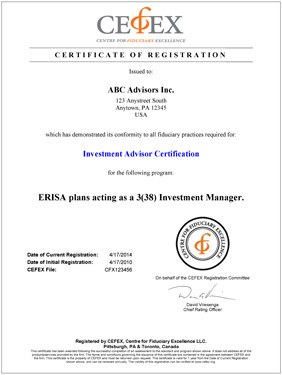 Often, retirement plans elect to seek general safe harbor protection (insulation from certain liabilities associated with investment decisions) by delegating discretionary investment authority to an ERISA Section 3(38) investment manager. CEFEX certified investment advisory firms that offer this safe harbor, as indicated in their scope of CEFEX certification, have been assessed on all of the associated ERISA requirements.